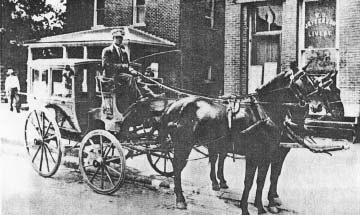 For many years W. O. Jefferson provided transportation to weddings and funerals with enclosed two horse cabs. He also had open rigs for salesmen and a vast "carry all" surrey complete with finge on the top. 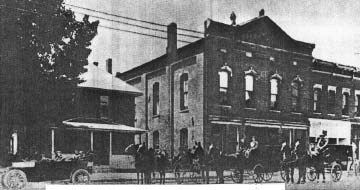 Mr. and Mrs. Jefferson lived at 215 E. Main Street, the building later occupied by the American Legion. The livery stable and hay storage was next door on the first level of the 1876 Hamilton Opera House. Ca.1910. Heller's Corner was the scene of one of the defeats that Little Turtle inflicted upon the Americans. On October 19, 1790, Col. John Hardin, leading a part of Gen. Josiah Harmar's army from Kekionga, came along this trail west of Ft. Wayne looking for Indians (using the traditional term for Native Americans). After taking possession of Kekionga from which the Indians had fled upon the approach of Harmar's army, the Americans next gave attention to the Indian stronghold on Eel River. Col. Hardin led this expedition but showed almost no caution, believing that the savage Indians would not fight an armed force such as he had. But he did not know his enemy nor the great Indian chief. The Eel River Indians under Little Turtle were awaiting his coming. Here where the trail crossed Eel River the Turtle had set a trap for Hardin. At that time there was a narrow prairie along the river flanked on both side by heavy time. On the far side of the small stream the Indiana had built a fire and around it had placed some trinkets. Believing that the Indians had fled, Hardin plunged ahead and soon most of his force was in the narrow defile. Then Little Turtle who was lying in ambush with his warriors, poured in upon this little army a deadly fire. Most of the men fled back on the trail, carrying Col. Hardin with them. A part of the army under Capt. John Armstrong stood their ground but were nearly all killed. Capt. Armstrong sank to his neck in the mud and mire and the Indians did not find him. During the night he witnessed the dance of victory over the dead and dying bodies of his comrades. When the Indiana left the next morning he escaped and later joined the army at Kekionga. Little Turtle led this same band of Indians on to Kekionga where three days later they inflicted a disastrous defeat upon another part of Harmar's army. Few people who speed along this modern road across Eel River, the Kenapocomoco, know or care that here occurred one of the bloody battle of Indian warfare. This battle occurred somewhere between the bridge over the Eel and the site of a Baptist church perhaps in the area later occupied by a cemetery and a marsh just south of it. Many of the roads of that time followed closely the Indiana trails. If we take the road north of the river and go about three miles west we come to the old Concord cemetery; go a mile south and cross the river.. then about a mile further on we come to an important historical site. If it has not disappeared we should find on the north side of the road a large stone on which we can read these words. "In memory of Col. Auguste d La Balme and his soldiers who were killed in battle with the Miami Indians under Little Turtle at this place, Nov. 5, 1780." La Balme was a Frenchman who came over with Lafayette to assist the Americans in their war of independence. He was skilled in the art of horsemanship. He came west and was with George Rogers Clarke at Vincennes. The success of Clarke suggested and inspired La Balme to attempt a conquest of his own. So he collected a body of men from Kaskaskia and Vincennes and started north with them up the Wabash. He had little opposition until he reached Kekionga. Here he was successful for the time being but did some foolish things that proved his undoing. The Indians and the white traders fled at his approach and he took possession of their stores and used them as his own. He then heard of the trading post on Eel River and wanted to get possession of that also. So, leaving some twenty men to guard the captured stores at Kekionga, he started out over the Eel River trail, the same as Hardin did ten years later. He was even more unfortunate. The early white settlers of this region received these traditions directly from the Indians. The immense number of relics and human bones found at this place would be additional proof. The reports of the immense stores at the Eel River post would be sufficient to cause La Balme and his men to attempt to secure them. A bit west of the La Balme memorial is one of the most interesting sites on Eel River.. It came to be owned by Alexander More, one of the first white settlers of the community. He received directly from the Indians and from his ancestor a great many stories of the early happenings in the area. His grandfather, John More was a soldier in Gen. Wayne's army. A great uncle, Samuel More, was a scout with George Rogers Clarke's army. Alexander More's nephews, Irvin and Charles, later owned farms in the community. They received this tradition from their father, William C. More and from their uncle describing the La Balme massacre and other events. Then Otho Winger tramped over the area with Charles More and received from Charles the account given by his father and uncle. So this is the oral tradition, written down. Here at the More farm a bold headland jutting out towards Eel River on the north from a hill with steep banks on three side. On the north the Eel River flowed at its base and beyond the river was a great swamp. On the east and west sides swamps lay just beyond the steep banks. Only from the south was there a level approach to the hill. The location was one that could well be defended against an attacking force. For years the line of an old breast work protecting the southern approach could be seen. Here at an early date a trading post was established that had been so well fortified that it could well be called a fort..
settlers came the old pathway down to the river where the boats landed was clearly visible. Kekionga could be reached by a portage of fourteen miles. By this portage and by the Kenapocomoco the French and British traders could reach the interior. Some say that the British general, Hamilton, helped the Indians establish this post on his way to Vincennes where he was captured by George Rogers Clarke. At any rate the Eel River Trading Post and Fort were known to all who ever came to Kekionga in those days. For many years Little Turtle from his village farther down the river had much to do in directing events at this place. No doubt he spent a lot of time there mingling with the traders and with the Indians. His sister, Tacumwah, had an important trading post on the north side of the river some distance away. Here no doubt was the center of many war plans by the Indians, encouraged by the British from 1780 to 1795. After the treaty of Greenville in 1795 the United States government built Little Turtle a house at this Eel River post and here he spent most of his last years. The place where his large double log house stood and where he lived in comfort attended by black servants is still known by some. It is said that he had two houses perhaps one of them was for his servants. At this place he made many attempts to improve the conditions of his people and from here he went forth on extensive trips. And finally, from here he went to the home of his son in law, Capt. William Wells, in Fort Wayne, where he died in July, 1812. The Second War with England was then on. When Gen. Harrison defeated the Indians at Fort Wayne, he, like other commanders before him, had to give attention to the post on Eel River. So in September, 1812, he sent Col. Simrall with a body of troops to destroy the place, but with the instructions that his troops were to spare the home of Little Turtle. The general defeat of the Indians in the war that followed and the destruction of the Post by Col Simrall caused the Eel Post and Fort on the Kenapocomoco to pass into history. But we can remember that for decades, yes for generations, it was the center of events in which both Indians and settlers had a great interest. Another place in this area to be mentioned is Seek's Village. One half mile south of the Eel River Post the road joined what was formerly known as the Yellow River Road. This, too, was an old Indian trail. One mile west there was a road going north across Eel River about on the eastern boundary line of what was known as the Seek's Village Reservation. At the treat of Wabash, 1826, the Indians of Seek's Village were granted fourteen section of land. The reservation was about two miles wide extending from this road to a line running south from the site of Columbia City. Seek, the chief after whom the village is generally named, was present at the treaty of Wabash in 1826 but seems to have disappeared before the treaty at the Forks of the Wabash in 1834. He is described as a gruff old Indian with a bull ring in his nose and was not very popular. John Owl, the first husband of Kilsoquah was raised at this village and here he was buried. From Kilsoquah many later settlers gained much information about this village and many events of importance. Bodkin and Nola Hall and it is stated that they made things pretty lively for a while. The building is the property of Jacob Strauss and that gentleman came up the other day and filed an affidavit against them for malicious trespass. The case has not yet been set for trial but will come up before Squire Sala. At the meeting of the Town Board Monday night George Burdge presented a proposition for lighting the streets with electric lights. In brief he proposes to put in a minimum of thirty lamps in such a manner as the Board may direct at the following price per lamp: for a 20 candle power lamp $15 per year; for 25 candle power $17.50; for 32 candle power $21.50; for 45 candle power $25 and as many more lamps at the same figure as the town may need or wish. The Board postponed any action and took the proposition under advisement. Just what will be done cannot be said. There are many citizens in favor of lighting the town while others are opposed. The JOURNAL cannot devote any space in this issue to a discussion of the matter and will postpone all comment until it takes a more definite shape. Mr Martin isan example of a pains-taking thorough artist and a visit to his parlors will amply repay the lover of the beautiful and artistic. Mr. Martin has been engaged in the photography business in our city for the past quarter of a century. His gallery is elegantly fitted up with all the most modern and improved appliances and the work turned out by him equals that of large cities. He makes all kinds of photographs, making a specialty of cabinets, palel, India ink. water colors and other large work. He carries a large line of picture frames. mouldings, albums, etc, and is making special inducements to the holiday trade. Do not forget the place, Martin's galley, south side Main Street. The various religious denominations number six and are as follows: Methodist, Lutheran, United Brethren, Christian, Progressive Brethren and German Baptists. They are all provided with good buildings with a seating capacity far beyond their membership. It might be said that the history of North Manchester started on Lot 2 of the original plat for it was there that Peter Ogan built his cabin even before he planned a town. His cabin stood on the site of what was known for many years as the Williams Drug Store lot which along with the building next east has been owned in more recent years by Clyde Eckhart The west or drug store room now is occupied by Dr. W. K. Damron and the room next east by Robert Gidley with his B & D. Shoe Store. (The West Room is now occupied by Dr. Hankee. If you look carefully at the outside west wall of the building you can see the old Williams Drug Store sign) There was a spring on the Williams lot, where Mr and Mrs Ogan resided, that probably being the reason for the location of their cabin in 1836. In a later day, in a transfer of title to the shoe store lot, the right was given to use the spring on Lot 2. Peter Ogan and his brother John, had helped chop a trail from Anderson to Wabash so the U. S. Treaty commissioners could negotiate a treaty with the Indians. It was concluded October 23, 1826 at Paradise Springs in Wabash. The site was near the later New York Central station in Wabash and by its provisions the Eel River country was opened for settlement by whites. Peter Ogan's first plat was small, from the alley east of Front Street to the alley east of Walnut Street and from the River north to Third Street. He sold part of a quarter section to the north to Allen Halderman, while Jacob Neff owned the land west of the alley between Front and Market. In later platting and now considered the original plat Neff and Halderman and Ogan, had lots surveyed from Front Street east to the River, and from Fourth Street south to the River this including all of the big bend in the river. the alley north of the Post Office, to Road 13. Halderman had entered the 80 acres east of Ogan's south 80 and a short time later purchased Ogan's south 80. On this tract is the Central Junior High School and the Old Cemetery along Market Street. In laying out what is now the original plat each owner, Ogan, Neff and Halderman retained ownership of their lands and the platted lots. Neff did not remain long in North Manchester but sold his holdings and returned to Preble County, Ohio, where he died. A death in the Halderman family caused him to set aside the Old Cemetery tract and in later years the Halderman heirs deeded the cemetery to the Town of North Manchester. For many years nothing was known of the Ogan family. This writer (Harry Leffel) traced the family to Richmond, Indiana, and a photostatic copy of the will of Samuel Ogan recorded at Richmond is now in the files of the News Journal. The will, probated February 15, 1843 names the following children in bequests: Peter and John, who had located in the North Manchester vicinity, Elias, who lived at Somerset; Lewis, who later died at Richmond , and who owned a farm later owned by Dorsey Brandenburg east of North Manchester; Stephen, Jasper County, Esther, wife of James Hendrix, Richmond; and Phemy, wife of Martin Elliott, Jasper County. The family probably originated in Eastern Pennsylvania. John Ogan operated a grist mill on Pony Creek, just south of the Road 113 bridge. He and his family were buried in the north part of the Old Cemetery. The Albert and James and Miss Sadie Rooney of Laketon were grandchildren of John Ogan. Lots l and 2 of the original plat extend east from the Williams drug store building to the west edge of Walnut Street if extended to the River. Peter and Mary Ann Ogan, his wife, sold those lots, which included the Ogan cabin to John and Jane Townsend December 22, 1843 for $100. Early accounts say the Ogans operated a tavern in the early days of the town, but the exact location is not known. Peter was busy in other matters. He built a dam across Eel River just below the covered bridge, dug a mill race across the nack of land, joining the river again near the later Farm Bureau Lumber Yard on South Mill Street and proceeded to build a saw mill. Later a flume mill race to furnish water power for a foundry and machine shop owned by Samuel Leonard. After starting the saw mill, Ogan added a buhr mill to grind grain. Ogan disposed of his lots and holdings rapidly and prior to 1875 had moved from North Manchester to a place south of town. A historian of 1875 stated Ogan was living in Indiana, but records in court houses to the southwest and west of Wabash County fail to reveal any trace of Peter Ogan and his wife, Mary Ann. Apparently they had no children. Although for convenience, the name North Manchester is used, the town was platted as Manchester. It was not until the town was incorporated in 1875 that the North was added, principally because there was another town in Southern Indiana by the name of Manchester and the post office department required a change in name of this town, which was platted later. At an early date the currency of the day or the circulating medium, particularly in the locality watered by the Wabash had only a local value, redeemable almost exclusively in consideration for land, etc. purchased of the State. The following were the chief issues and in their day were well known. In 1840, the Legislature of Indiana authorized and directed the issue of scrip which in time came to be known as "old scrip" bearing interest at the rate of six per cent per annum, and was receivable to State and county taxes and for the payment of certain other specific obligations. Since it was not receivable at par for all purposes, for many years it was taken only at a discount sometimes at a very heavy rate. Yet, in the course of time, a large amount of interest having accumulated in these evidences of debt guaranteed by the State, it was worth more than the face, and was for that reason a source of speculation in the hands of persons who were able to purchase it at a large discount and by so doing were able to realize large sums from small investments. Bank scrip was another issue by the State to pay off a debt due the State Bank of Indiana for money advanced to contractors for the construction of the canal (Wabash and Erie) to carry on the public works of the State forwarded under the act known as the "Internal Improvement" law. This was of less value than the "old scrip" but in the end became a subject of speculation by the same process. progressed very slowly since there was no money to pay contractors except such as arose from the sale of canal lands, an amount equaling about twenty-five per cent of the work done. On a settlement with the contractors, the Chief Engineer, Jesse L. Williams, issued the drafts to the holders of claims, one on red paper for twenty-five per cent, to be paid on presentation to the Fund Commissioner which was called "Red Dog," and another for the unpaid balance of seventy-five per cent on white paper, which was called "White Dog" to be paid by the Fund Commissioners as the land sold should furnish the money. Mr Williams wanted the State to provide for the payment at an earlier date than that agreed but the State failed to do anything so Mr. Williams engraved something appearing to be a bank bill of very low value.. This second "White Dog became subject of vast speculation in the hands of parties having an opportunity to get quantities of it. It bore interest however from the date of issue and was received in payment for canal lands. Blue Dog was an issue authorized by the Legislaure of 1841-42 for the extension of the canal on the western division. Thus the State followed the example of Mr. Williams. This issue was on paper of a blue tinge; hence its name "Blue Dog." It was receivable also for canal lands and the subject of much speculation like other similar issues. Blue Pup was another currency issued in small bills by contractors for work, material and necessities and payable in "Blue Dog" when presented at the proper office in sums of $5. This, giving character to issues of this class, originated from the "wild cat" money, which in the year 1836 was so plentiful in Michigan and proved so worthless. A dog, being considered a valueless thing, the word was applied to the canal land scrip and the "Red Dog" " Blue Dog" "Blue Pup" which went into use on the Maumee and in the Wabash valley at accommodating rates. These issues of scrip with sometimes unpaid county orders or more valueless city orders and the issues of suspended banks constituted the circulating medium in the localities where they were recognized at all during the period from 1840 forward until that species of paper went into disuse from force of circumstances. The evil consequences resulting from the uncertain value of these various issues produced a financial revolution in the past that required long years to repair the wrong done to the credit and energy of the people.